can get my hands on. Rose Pressey definitely falls into this category! 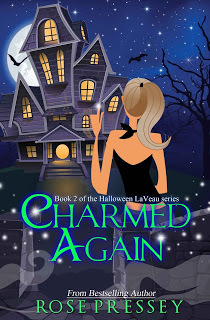 Hallie LaVeau is back with Nicolas, Liam and the rest of the Underworld gang. Nicolas is in trouble and now that Hallie is in charge of the entire Underworld she has a big problem to solve. Actually, Nicholas is the one with the problem as he's been accused of doing the unthinkable. With Hallie being so new to everything, it's going to take everything she has, plus the help of her friends both old and new to figure this one out. I found the continuation of Hallie's story to really grab me and take me into the pages. Not sure I like some of the new characters, but isn't that to be expected? There has to be a bad guy in the mystery. Otherwise, what is the purpose of the story? This is definitely a book that is hard to put down and could easily be finished in a day without any outside interruptions. Of course, if you do that, then you'll have to wait longer for the next book!